Watercolour and wash drawing of the interior of a cave temple at Ellora, from an Album of 83 drawings; 80 of landscapes and antiquities in the northem Deccan, 2 portraits and 1 flower study made during a tour chiefly to Ellora, Rauza, Daulatabad, Aurangabad and Ajanta. September to November 1849. Although the artist is unidentified, these drawings are of some interest since they show the state of the Ajanta and Ellora Caves soon after the Royal Asiatic Society had brought them to the Company's notice in 1844. Robert Gill had been deputed to make a record of Ajanta in 1846 and was presumably on the spot when these sketches were made. works were done under the patronage of the Kalachuri, the Chalukya and the Rashtrakuta dynasties between the sixth and the ninth centuries. The caves are remarkable for the artistic quality of the sculptures that adorn them. 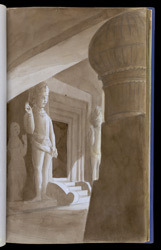 This drawing depicts the large guardian figures of dvarapalas that guard the entrance to the linga shrine in the large hypostyle hall of Cave 29, known as Dhumar Lena. The columns of the hall have massive square bases and fluted cushion capitals such as those of the contemporary Elephanta cave.